Prior to the Galaxy S5 announcement, a number of leaks indicated that Samsung would launch a version with its in-house Exynos processer and one that featured Qualcomm’s hardware. However, Samsung failed to mention the existence of an octa-core version of the Galaxy S5 at its announcement, and instead revealed just the Qualcomm Snapdragon 801 variant of the device. 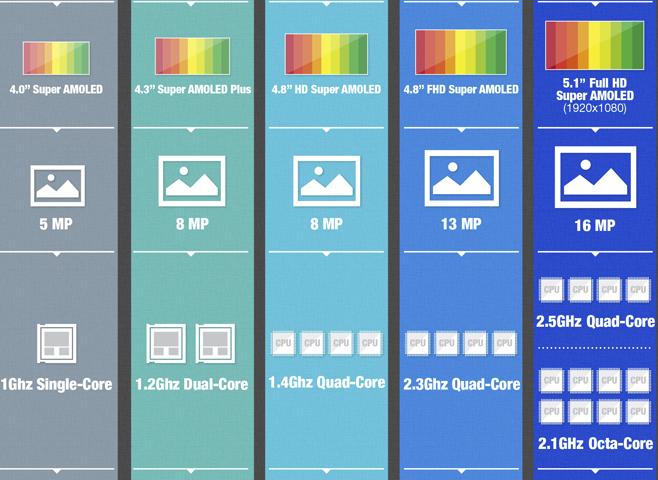 An infographic posted on Samsung’s blog alludes to an octa-core version of the Galaxy S5. It is possible that Samsung is looking to launch an Exynos-based Galaxy S5 variant at a later date. The octa-core CPU will likely be clocked at 2.1 GHz. The infographic detailing different Galaxy S handsets is based on variants offered in South Korea, so it is likely that the Exynos octa-core variant will initially be offered in the country. Samsung is said to be working on an Exynos Infinity processer that was teased last week. The processor was initially set to debut at the MWC, but Samsung made no mention of it at its press conference. It is feasible that the processor will be announced sometime later.